Guard House with Restroom comes fully factory assembled ready to set, connect, and use! Why have your guard leave their post to use the restroom wasting time and money. 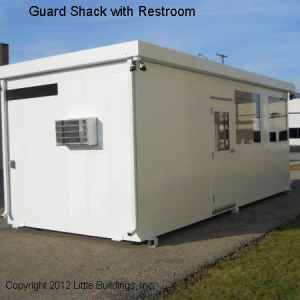 Order a new Little Building guard shack with bathroom (restroom) saving you time and money! Handicap accessible guard shack with restroom complies with federal handicap accessibility codes when a proper ramp is provided to the door by others in field. Standard features for a Little Building Guardhouse with Restroom include all galvanized steel welded construction for rugged use, bathroom partition with swinging aluminum door and closer, mirror, coat hook, paper towel holder, and grab bars. Plumbing fixtures shipped in loose boxes for field installation by your plumbing contractor. Tread plate steel floor on a 4" elevated base is standard or , ceiling, and restroom floor are insulated with glass fiber insulation. With a guard shack with restroom you can select floor options including aluminum tread plate, rubber tile, or sheet vinyl surfaces. Swinging steel door with commercial duty hydraulic closer and safety glazing help complete this guard shack with bathroom. Pre cut holes in floor allow you to set your new Little Buildings Security office with restroom over your pre-set plumbing and electrical stubs. Choose your paint color from our large color chart to complement your company, school, or military scheme. Need your unit customized to meet your location requirements? NO PROBLEM! Our in-house design and engineering staff will work with you to get you the guardhouse with restroom that best suits your application. See additional guardhouse with restroom options. Optional features on this guard booth with bathroom include restroom partition, door and fixtures (shipped loose) dual air conditioners, tinted insulated glazing, transaction window, waiting area, special raised counter, half door with closer, and aluminum tread plate floor. For high-security installations we can help you with a Bullet Resistant Guard Shack with restroom. Bullet Resistant Guard HouseLevels range from UL level I to level VIII.